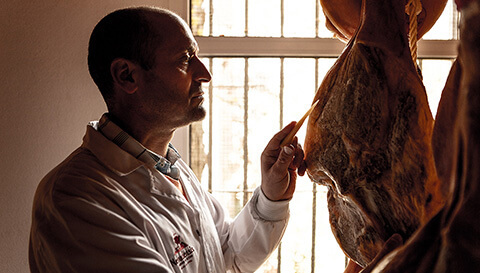 Jamones Nevadensis is a family-run business that has been producing traditional Spanish ham using the authentic methods passed down for nearly 200 year over several generations. We prepare our natural cured ham in the small Spanish white-washed town of Trevélez, which is in a region called La Alpujarra in the province of Granada. The town is situated at an altitude of approximately 1.750m (5.750ft). 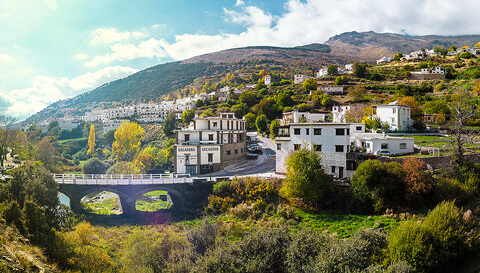 This southern Spanish town is located in the heart of the Sierra Nevada Nature Reserve at the foot of the highest mountain of mainland Spain, Mulhacén, which rises an impressive 3.482m (11.425ft) above sea level and is snow-covered throughout winter. Our curing houses, or bodegas, have been purposely designed to make optimal use of the micro-climate. The cold, pure, fresh air, combined with the cleanliness of the protected mountain range, form the basis of Nevadensis‘ traditional Spanish ham. A product with such a gentle aroma and delicate flavour can only be achieved in this environment and using a long, slow process of curing ham. Our customers demand the best that the world of traditional Spanish ham has to offer. This includes a product that is one-hundred-percent natural. Of course, our ham is entirely free of artificial additives, including preservatives and colourants. You can trust us to provide you with the most naturally produced Spanish cured ham available today. The only preservative in the traditional process of curing ham is sea salt. The evidence comes with the quality certification that our ham has carried for nearly 15 years. Proof that our ham is free from artificial additives in accordance with international standards (ISO 9001:2008). All thanks to the privileged geographical location of our curing houses in the Alpujarra Granadina. Are you ready to try our delicious ham? Don’t just take our word for it, order your authentic, natural and traditional Spanish ham online today! Jamones Nevadensis Ham with Altitude.